Border Ambush, award-winning author Melody Groves' hard-biting novel about life on the rugged Southwest frontier during the 1860s and the book that set the stage for her Colton Brothers Saga series, is now available online and in bookstores. Border Ambush is published by La Frontera Publishing (http://www.lafronterapublishing.com) and distributed through the University of New Mexico Press (http://www.unmpress.com). "The early 1860s were a remarkable time in the settling of the West," Groves said. "As the nation girded for the Civil War, the Southwest frontier faced its own growing clash between Indian tribes and white settlers. The frontier was raw, many times lawless, and always harsh, and only those men and women strong enough to triumph over nature and human brutality were able to survive. "With the Colton brothers, first James and Trace," Groves continued, "and then through other Colton family members in my later novels, I explore what life was like back then and the many conflicts between tribes, settlers, outlaws, and Union and Confederate forces, and people trying to eke out a life in New Mexico Territory." In Border Ambush, readers are introduced to Groves' two main Colton characters and begin a journey into a remarkable family saga set in the West. Robbed and beaten by outlaws, stagecoach guard James Colton vows to get justice and recover his grandfather's watch. He hunts the bandits, only to face a crooked sheriff who gives him no choice but to shoot. Charged with the sheriff's murder, James' solitary hope is to get the robbers to testify to the sheriff's villainy. With Older brother Trace along to help, the Coltons track the robbers into Mexico. But after Trace is gravely wounded, James is ambushed by lawmen as he struggles to bring his brother across the border. The hangman's noose seems closer than ever. Can James prove his innocence? It's 1860 southern New Mexico. Border Ambush exposes the American Southwest for what it really was - rough, tough, and brutal. 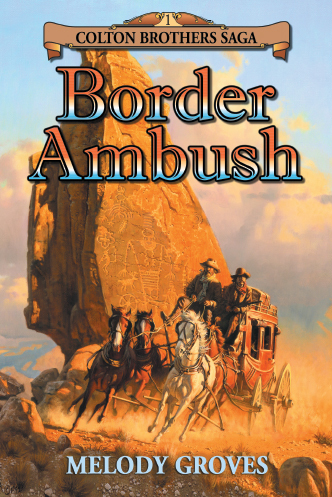 "Border Ambush is the foundation for the Colton Brothers Saga series and historical fiction that will keep you turning pages," said Mike Harris, publisher for La Frontera Publishing. "Readers can follow the brothers' struggles and triumphs in Sonoran Rage and Arizona War, a 2008 New Mexico Book Award winner, and in future adventures as well." Cheyenne, Wyoming-based La Frontera Publishing (http://www.lafronterapublishing.com) publishes historic fiction and non-fiction books about the American West. For more information call (307) 778-4752.